Roth: One piece of advice I have is: Want something else more than success. Success is a lovely thing, but your desire to say something, your worth, and your identity shouldn't rely on it, because it's not guaranteed and it's not permanent and it's not sufficient. So work hard, fall in love with the writing-the characters, the story, the words, the themes-and make sure that you are who you are regardless of your life circumstances. That way, when the good things come, they don't warp you, and when the bad things hit you, you don't fall apart. Roth: Other aspects of my identity have more to do with the factions than my age. The faction system reflects my beliefs about human nature-that we can make even something as well-intentioned as virtue into an idol, or an evil thing. And that virtue as an end unto itself is worthless to us. I did spend a large portion of my adolescence trying to be as "good" as possible so that I could prove my worth to the people around me, to myself, to God, to everyone. It's only now that I'm a little older that I realize I am unable to be truly "good" and that it's my reasons for striving after virtue that need adjustment more than my behavior. In a sense, Divergent is me writing through that realization-everyone in Beatrice's society believes that virtue is the end, the answer. I think that's a little twisted. I think we all secretly love and hate categories-love to get a firm hold on our identities, but hate to be confined-and I never loved and hated them more than when I was a teenager. That said: Though we hear a lot about high school cliques, I believe that adults categorize each other just as often, just in subtler ways. It is a dangerous tendency of ours. And it begins in adolescence. Roth: I tried to construct the factions so that they spanned a wide range of virtues. Abnegation, for example, includes five of the traditional "seven heavenly virtues:" chastity, temperance, charity, patience, and humility. That said, it would be interesting to have a faction centered on industriousness, in which diligence and hard work are valued most, and laziness is not allowed. They would be in constant motion, and would probably be happy to take over for the factionless. And hard-working people can certainly take their work too far, as all the factions do with their respective virtues. I'm not sure what they would wear, though. Overalls, probably. Roth: I recently finished Imaginary Girls by Nova Ren Suma, which I would call "contemporary with a paranormal twist," or something to that effect. It's about a girl whose sister has a powerful kind of magnetism within the confines of a particular town, and how their love for each other breaks some things apart and puts other things back together. It was refreshing to read a young adult book that is about sisterhood instead of romance. It's one of those books that makes you love a character and then hate a character and then love them again-that shows you that people aren't all good or all bad, but somewhere in between. Imaginary Girls gave me a lot to think about, and the writing was lovely, which I always love to see. 11/27/2012 Ruth Silver said: Veronica Roth does a fantastic job creating a Dystopian world. 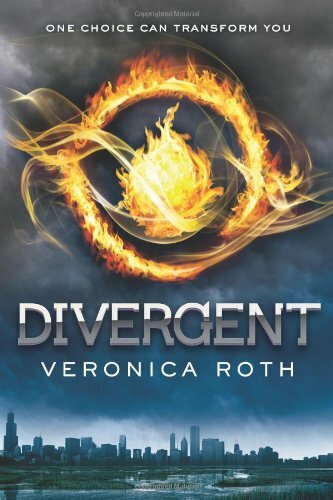 Divergent was a quick read and one that I didn't want to put down. 2/16/2012 DS Clark said: I am enjoying the dystopian world. 6/3/2011 Erin Schneider said: Amazing, amazing, amazing read! If you liked The Hunger Games, you'll definitely love this book!